﻿Why should you trust Chase Aviation Company to sell your aircraft? Better representation, better results, every time. We don't just represent aircraft for sale, we represent the owner of the aircraft and their interests. We do not take "non-exclusives" nor will we try to peddle an aircraft that is "off-market," or "chase deals." Why do we work this way? Quality of service. Since our interests are directly tied to our Client's we can focus purely on what it takes to get them the most amount of money we possibly can for their aircraft while providing a Buyer with a level of confidence they need to do so. We find the Buyer faster. We find buyers and create demand for our clients aircraft through a cutting edge and strategically coordinated marketing program that involves a single, coherent message distributed by our website, major advertising locations, eBroadcasts and social media, not just random acts of marketing. It has taken a long to time get as experienced as we are with global aircraft acquisition and resales. We know what it takes, how to overcome the challenges that export / import takes and best yet, how to market aircraft to regions experiencing an increase in aircraft sales with exchange rates that will get you more for your aircraft. We get better offers, faster. Getting an inquiry is one thing, converting that inquiry into a written offer is another. One of the highly innovative ways we been able to deal with tire kickers is to have an “offer generator” right on our website where a buyer can fill in the important fields of an offer which then sends it to us for signing. We never take competing listings. We do not take other aircraft listings which will compete with our Client’s aircraft. It makes no sense that within a sales company aircraft owners will allow their aircraft to compete with others for sale by the same agent. The only winner there is the owner willing to sell for the lowest price. As aircraft resale consultants we have dozens of roles and responsibilities but none are as important as finding the Buyer. We do that through our Marketing and Advertising Program which is strategically coordinated across several different mediums like our website, major advertising locations, eBroadcasts and social media. Our eBroadcasts are sent out to our proprietary, worldwide database of over 30,000 active subscribers. Fortune 500 corporations, billionaires and high net worth individuals, movie stars, music stars, aircraft owners, flight departments big and small, and tens of thousands of people and businesses in the aviation community. We maintain an extremely low opt-out rate because each one of our eBroadcasts is custom designed in-house so no two are alike. We never send ANY third party advertisements and keep the amount of mailings we do to an absolute minimum. By the way: Our eBroadcasts account for over 30% of our sales. There was a time when having a website was a big deal; those days are gone. What’s needed now is a website that does more than just show pictures and text. Our website was professionally designed with the intent to engage the user (prospective buyer) beyond simply informing them. We do this with three call-to-action buttons. An “Inquire” button so that they can easily get in touch with us. Another, the “Spec Sheet” button so that they can download the PDF version of our aircraft spec sheet and keep it for printing or offline viewing. And now we’ve made it even easier to convert interest to inquiries with our newest addition, the “Make an Offer” button. A highly innovative feature, this button links to a page on our website where a Buyer can fill out a form to populate the fields of an actual Letter of Intent document rather than have to inquire, ask for a draft version, and then print, sign, scan and send back. 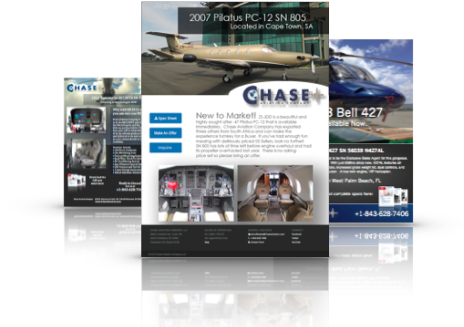 Our Client’s aircraft are now literally easier to buy than the ones that are on the market competing with it. If a picture is worth a thousand words, video is worth a million… or ten. That's the reason that we developed a new form of direct marketing we call video slide shows. A mixture of both photos and video, these engaging forms of media also include text messages that deliver the viewer useful information we want them to know while holding them captive for the entire video. These videos are produced in-house which saves thousands of dollars; a cost we don't have to pass on to our Clients. A cost they dont have to pass on to the aircraft Buyer. We target the end-user, the retail Buyer. We put a lot of stock into having a clean, easy-to-read website and professional image. This message is carried over to all of the places we advertise which currently exceeds 20 locations throughout the world. From print publications to online placement and social media, our objective is to get our aircraft in front of as many people as possible. Chase Aviation Company is made up more than just sales staff. We are a highly experienced team that works near seamlessly with one another, united by a common goal of selling our Clients aircraft faster and for more money than our competition. With hundreds of millions of dollars of aircraft sold, we've proven to ourselves and to our Clients time and again that we are the "best of the best" but strive to be better each transaction. After each aircraft we sell we make a list of all the things that went right, and all the things that we could have done better. We are disciplined professionals with the experience you need to make sure your aircraft and your interests are represented properly, right from the beginning. Setting realistic expectations using "real" photos. We always want to convey to prospective aircraft purchasers the actual condition of the aircraft that we are selling. And so many aircraft sales companies get this wrong. Professional aviation photographers stage aircraft with plates of gourmet food and bottles of Dom Perignon neither of which, to say the least, will convey with sale. And what good are exterior photos of the aircraft at night with illumination that drowns out the actual condition of the plane? Our photos and video are shot in extremely high resolution as we would expect a buyer to see the plane when they show up prior to purchase. Less surprises, more likelihood of closing. 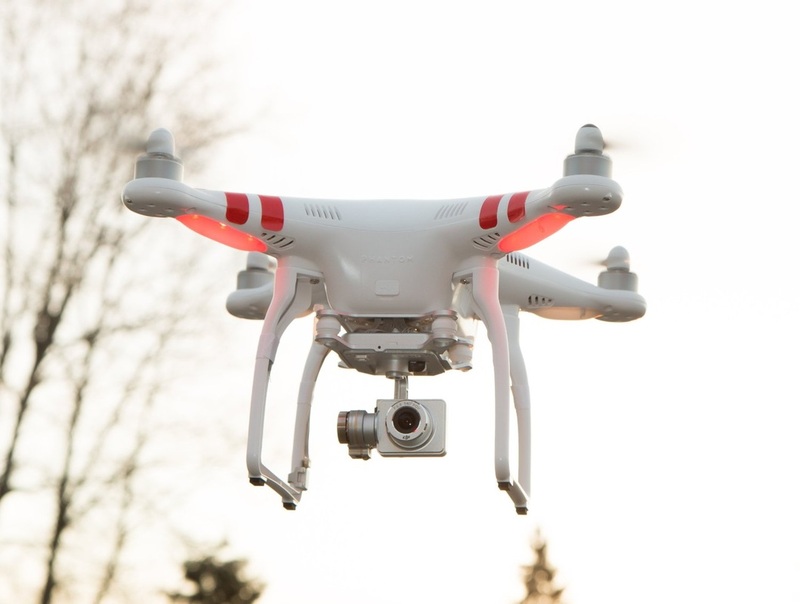 We also use the DJI Phantom Vision Plus drone helicopter for stunning effects and unique angles that create a lasting impression on the Buyer. Are you ready to Cut to the Chase? We are too. Call, inqure or stop by today.